For Teaser Tuesday we take the book we are currently reading, let it open to a random page and select two sentences from the page as a teaser. 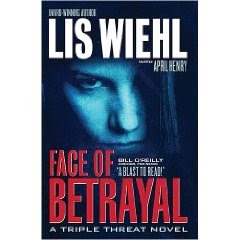 I am currently reading Face of Betrayal (A Triple Threat Novel) By Lis Wiehl with April Henry so that is where this teaser is from. And that they should keep all their essentials - their ID and prescriptions - in one place, ready to go. Oh, and they should use a code sentence when they are on the phone and he can hear them. For more Teaser Tuesday posts, head over to Should Be Reading for all the links. You know, in case your To Be Read Pile isn't quite large enough yet. How many books (roughly) are in your tbr pile? Is this in increasing number or does it stay stable? Do you ever experience tbr anxiety in the face of this pile? Wow, my To Be Read pile is not as out of control as it use to be, but it is still in need of some serious taming. If you want to know how many actual books I have sitting at home waiting to be read, that number is probably around 200. Now I do need to go through those because some of them no longer interest me and can be weeded out. Then you have the virtual To Be Read Pile. Those are the books that I want to read, but I haven't picked up yet. I don't have an actual list of these (something else for me to work on), but I would guess that number is somewhere closer to 100 and can easily grow any time I set foot in a bookstore or library. The only anxiety this question brings up in me is the worry that my books are getting out of control and I'll never be able to read them all. Considering the size of my pile and the rate at which I add books, that is a legitimate concern. This question reminds me that I really need to clean my bookshelves off and at least get my wish list of books to read written up. Ah yes, more tasks that need to be completed. To see more answers to these questions, head over to Musing Mondays at Just One More Page.